Democrats delivered bankers a whipping after the financial crisis. More draconian regulation was only kept at bay by Republican pushback. With the GOP now calling for a big bank surcharge and a tax hike on fund bosses, the industry looks even more friendless and vulnerable. 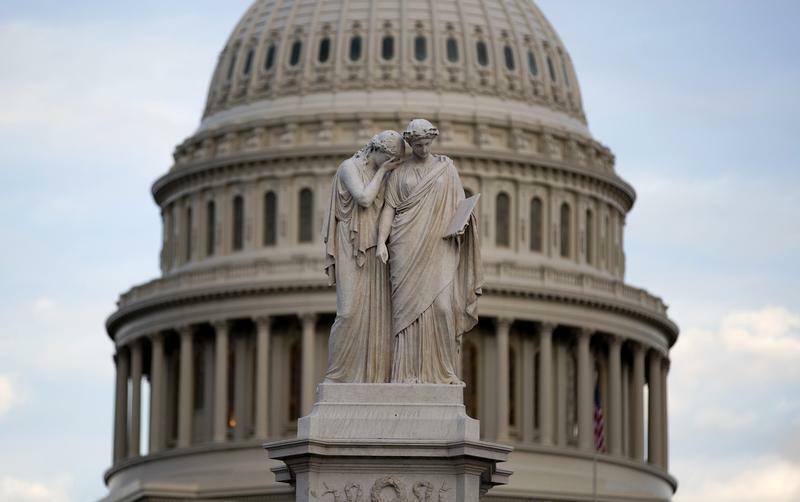 The statue of Grief and History stands in front of the Capitol Dome in Washington October 15, 2013. U.S. House Ways and Means Committee Chairman David Camp unveiled a sweeping plan for tax reform on Feb. 26. The Republican leader’s proposal would consolidate the seven income tax brackets to just three with lower rates and fewer deductions. It would also reduce the business tax rates to 25 percent from the current rate of 35 percent. The plan also includes a number of provisions that would affect the financial industry. It would require large institutions to pay a quarterly 0.035 percent surcharge on worldwide consolidated assets exceeding $500 billion. It also eliminates the carried-interest tax break, which would force hedge fund managers and private equity firms to treat compensation as ordinary income instead of paying taxes at the lower capital-gains rates. Additionally, it lowers the cap on mortgage interest that could be deducted to $500,000 from $1 million.